Google kicked off its annual developer conference this week, showing off its latest and greatest to the people building things for its platforms. But a group of activists want to hold the tech giant accountable for how these very platforms are manipulating some of its most vulnerable users. Two advocacy organisations are held a protest at Google headquarters, urging the company to remove anti-abortion "crisis pregnancy centres" from search results for abortion services. Crisis pregnancy centres are organisations that counsel women against having abortions, often posing as actual medical clinics and frequently dispensing false information about reproductive health. In 2014, Google agreed to remove paid ads for these centres after advocacy groups found that searches for "abortion clinics" delivered ads for crisis pregnancy centres around 79 per cent of the time. However, opportunity for deception on Google's platforms remains. Earlier this year, Gizmodo found that a Google Maps search for "Where can I get an abortion?" included crisis pregnancy centres in the results. When 20 people across the US replicated this search query, all but two were served up crisis pregnancy centres in the Maps results. This week, progressive advocacy organisations UltraViolet and CREDO are gathered at Charleston Park, which is the adjacent Googleplex, to deliver a petition before Sundar Pichai's I/O keynote. The petition, which has collected over 100,000 signatures, urges Google to stop promoting crisis pregnancy centres to users looking for abortion services. The groups also planned to hold a light projection in a number of spots near the amphitheater where the Google conference is held. The projections read: "Google, stop lying to women. 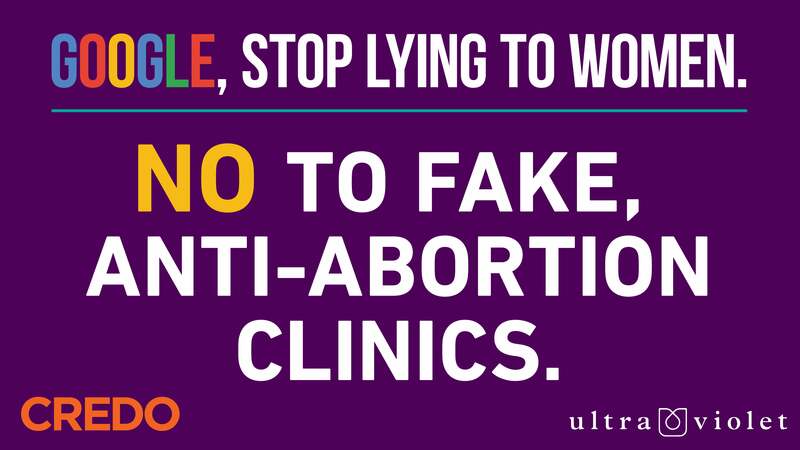 No to fake, anti-abortion clinics." "Google is complicit in luring vulnerable, pregnant women to anti-abortion centres posing as legitimate reproductive health clinics that deceive, lie to, and shame them out of abortions," Shaunna Thomas, co-founder of UltraViolet, said in a press release. "Users trust Google to be an honest broker here. The company must take action immediately to uphold its advertising policy and ensure abortion care search results are accurate." UltraViolet and CREDO note that the timing of this week's protest and petition closely align with a US Supreme Court case dealing with similar issues. The case - NIFLA v. Becerra - deals with California's Reproductive FACT Act, which was passed in 2015. The law requires licensed clinics to inform clients of certain services they provide, including ultrasounds, pregnancy tests and abortion. It also requires unlicensed medical facilities that provide similar services to inform their clients that they don't have a medical certification. The National Institute of Family and Life Advocates (NIFLA) filed a lawsuit against the legislation, arguing that it infringed on their freedom of speech. The case is ongoing.